A great way to market your app is to create a promo video or trailer that showcases your app. Users can be drawn in by a great icon, screenshots or description. But what can really put them over the edge is a video that highlights the different features of your app, and what makes it stand out. If you are on a budget, it is possible to create a basic video on your own. There are multiple ways to record your app and your interacting with it. 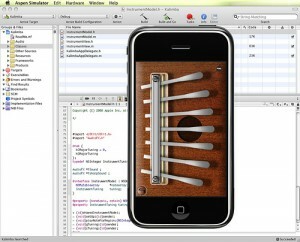 Use the iOS simulator provided by Apple to run your app on a Mac. Then use video screen capture software like Jing, Camtasia or other screen recorder tool to capture your interaction. You can also add effects like thumb presses to replace your mouse pointer using tools like Sim Finger. Note that this approach won’t work for apps that require access to the camera or other device specific features that are not available in the simulator. To get a better representation of your app running on your actual device, you could try mirroring your device (iPhone / iPad / iPod Touch) onto your TV, via an Apple TV, and then recording your video from TV. A 3rd party solution that seems to work quite well is Reflector, which lets you mirror your device to a Mac / PC, where you can then record the screen cast. Have a camera on a tripod, to keep the video stable. Place your device on a table or flat surface to keep it stable. Zoom your camera in to focus on the app to maximize the available viewing space. Be aware of your finger blocking the view, and only use it when necessary. Unless it’s meant to be a tutorial video, keep it short and to the point. Teaser videos should be between 30 seconds to 1 minute long. If you want to record other elements of your app, then consider breaking them down into separate videos. Use a video editing program like iMovie to add a title and explanations or feature summaries of different screens, so the user understands what they are seeing. Edit out long loading screens to keep the video short and to the point. Add a catchy jingle to the background, to keep the video interesting. If you’re speaking in the video, consider recording the audio separately if the sound is not clear. Here is a video that was done by an app developer himself, using the iPhone Simulator, screen cast software and iMovie to edit the final video. If you have a marketing budget, then you can get significantly better quality by hiring a professional to create your video. How Much Does an iPhone Promo Video Cost? Once your video is completed, start posting it on your app site and social media platforms. Also post it to YouTube, Vimeo and other video platforms that can get your app increased exposure from search engines. Use it when posting your app on review sites. Also monitor the comments and feedback you get on the video from different channels to gauge the reaction from your potential audience. Thanks for mentioning Apptamin! Just wanted to say that we now have a “live video” offer, with environments in option. It starts at $1200 so it’s a little bit more expensive but still a very good deal. Also, Reflection is now called Reflector (you got the link correct but the name changed). Thanks Sylvain, I’ve updated the Reflector name. Thanks for awesome information. I would like to share cheapest source ever I found with quality. I’ve never recommended a gig on http://fiverr.com, but I have to recommend this one. I find it really tough to make promo videos for my apps, I think Mac users may have tools to do this sort of thing a bit easier, but on PC I find it a really hard slog, without even taking into account the imagination and planning needed. I try lots of gigs on fiverr, some good, some bad, most inbetween, but this is really exceptional. One video he’s done for me, delivered in under 24 hours and at a little over 3 quid!